The experienced practitioner, lord Brian Griffiths of Fforestfach, Vice-chairman of Goldman Sachs, investigates the main causes of the financial crisis. His analysis focuses not merely on the technical aspects but also on the underlying cultural and moral failures which made such widespread failure possible. He emphasizes that an indication of greed must be distinguished from a simple accumulation of goods; the greed present throughout our Western culture is rather a consumeristic idolatry. Lord Griffiths then indicates five points which he believes to be essential in a comprehensive answer to the crisis. 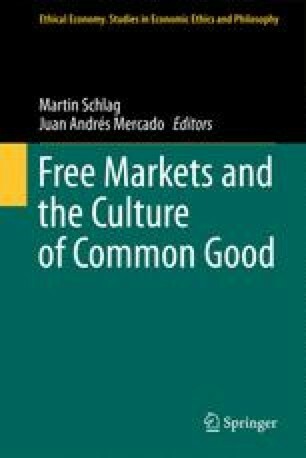 Encompassing the aforementioned technical, cultural and moral elements, they attempt to provide key criteria to re-establishing a solid financial sector and society: the banking system must regain the trust of the private and public sectors; restricted competition in the banking market should be expanded; virtues must be lived as the essential pre-conditions for actual business principles; banking bonuses should be balanced by generosity; debt ceilings must be re-established; and the goal, self or God, must be clearly delineated. Such a re-examination will allow banking practices to well resume the important role they play in a developed society. Benedict XVI. 2009a. General audience. http://www.vatican.va/holy_father/benedict_xvi/audiences/2009/documents/hf_ben-xvi_aud_2009 0422_en.html. Accessed 22 Apr 2009. Sentamu, John. 2010. The way to come closer to God is to be generous and honest towards everyone, Presidential Address to the General Synod. http://www.archbishopofcanterbury.org/2932. Accessed 10 July 2010.